Scott Robinson has been a life long resident of Tipton, Indiana. With a "Hot Wheels" in his right hand and a pencil in his left hand, Scott started illustrating anything that had wheels around the age of two. His first illustrating memories are of drawing his father's pick-up truck. His current illustrating favorites are STILL anything that has wheels. Scott was married to his lovely wife, Charlene, in May 2013. Scott's hobbies include automotive illustrating (...of course), yard work, photography, reading/collecting car magazines, participating and/or attending car shows, street-legal drag racing, collecting automobilia, working on this website & facebook page (search for the hashtags "#HPA" or"#highperformanceartist" on facebook), working on his two Firebirds, and keeping his Silverado clean & well-maintained for its daily-driver duties. Scott also frequents the LS1tech.com message board under the user name "y2k_ta". He is a moderator in the Pontiac Firebird 1967-2002 forum & several other forums on the site. Look for his frequent posts there & throughout the site. 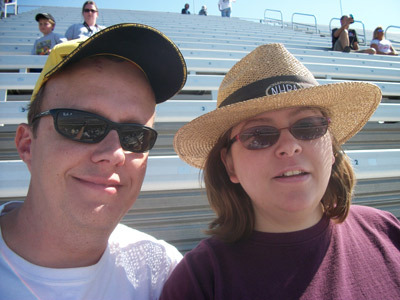 Scott enjoys watching NHRA Mello Yello Drag Racing, NMCA Drag Racing, Radial Versus The World & X275 Drag Racing, Australian V8 Supercar Championship Series, and SCCA American Sedan racing. Scott enjoys attending the NHRA U.S. Nationals in Indianapolis every year and various other automobile-related events throughout the year including the Street Car Takeover Indy Event, NMCA World Finals/LSX Shootout at Lucas Oil Raceway in Indianapolis, Trans Am Nationals, and numerous Central Indiana Car Shows. Scott is a member of McGrawsville United Methodist Church, POCI, NMCA, Indy Firebird Club, Hoosier Pontiac-Oakland Club & a moderator on the LS1tech.com message board. Scott always enjoys hearing comments and suggestions about his website that is "parked" at www.car-art.us. If you need some automotive artwork, he's the guy to contact.